This week in 1945, President Franklin Delano Roosevelt was sworn in for an unprecedented fourth term in office. In 1945, Attorney Henry M. Gallagher returned to the Farrish Johnson Law Office after serving seven years as MN Supreme Court Chief Justice. Franklin Delano Roosevelt, commonly known as FDR, was an American statesman and political leader who served as the 32nd president of the United States from 1933 until his death in 1945. He is often rated by scholars as one of the three greatest U.S. presidents, along with George Washington and Abraham Lincoln. Roosevelt was born in 1882. He graduated from Harvard College in 1903 and attended Columbia Law School before practicing law in New York City. In 1905 he married Elanor Roosevelt, and the couple went on to have six children. In 1921, at the age of 29, he developed a paralytic illness. During his presidency, he led the nation after the attack on Pearl Harbor on December 7, 1941, for which he famously called “a date which will live in infamy.” Roosevelt obtained a declaration of war on Japan. 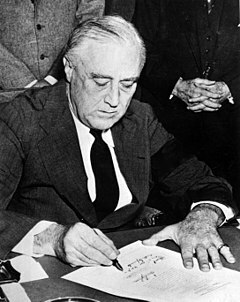 Roosevelt died on April 12, 1945, four months before the United States would drop nuclear weapons on two major Japanese cities. That same year he commenced a practice of law at Waseca, first in partnership with Fred W. Senn, who later became a district court judge in the area, and then in partnership with G.P. Madden and his brother Frank Gallagher. Later he joined the firm of J.W. 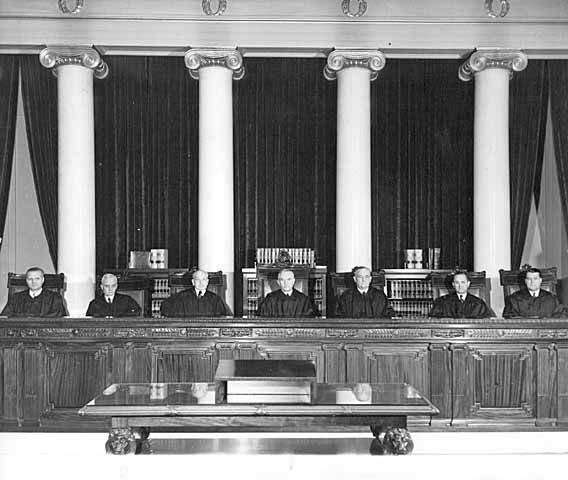 Schmitt and Charlotte Farrish before being appointed to the Minnesota Supreme Court in 1937. Three of his nephews, Daniel, Lawrence and Michael Gallagher, also became attorneys. 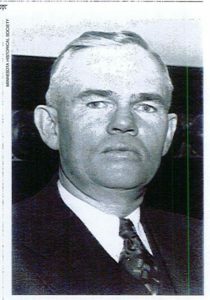 Gallagher was Chief Justice of the Minnesota Supreme Court from 1937 to 1944. His brother, Frank T. Gallagher, became an Associate Justice of the Minnesota Supreme Court from 1947 to 1963, making the two Gallaghers the only pair of siblings to serve on the Court. Gallagher retired from the Minnesota Supreme Court in 1944, returning to the Mankato law firm, Schmitt, Gallagher & Farrish. 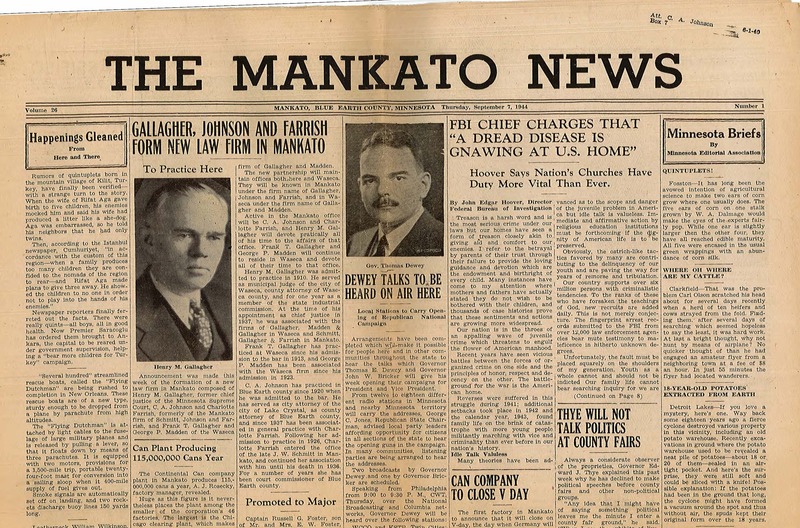 The Mankato News article announced the formation of a new law firm in Mankato, comprised of former Chief Justice Gallagher, C.A. Johnson and Charlotte Farrish, with Frank T. Gallagher and George P. Madden officing out of Waseca. Gallagher had an innate understanding of the law and the reasons for it. From this understanding came appreciation of the law’s complexities; the never-ending need for examination and research of statute of precedent. He did not try to give, and was not moved by, the quick or flippant answer. His opinions and advice were based solidly on facts, the law and common sense—blended in such a way as to make the complex seem simple. Robert Sheran was a law clerk for Justice Gallagher and later joined Gallagher’s Mankato firm before he was also appointed to the Minnesota Supreme Court, in 1963. Justice Gallagher died on April 3, 1965. At his memorial, Sheran noted Gallagher often said, “Everyone owes something to his community besides the payment of taxes.” Gallagher was a great person of compassion and humility. He was able to find the essential quality of goodness in everyone and to accord each individual courtesy and respect regardless of his state or condition in life. 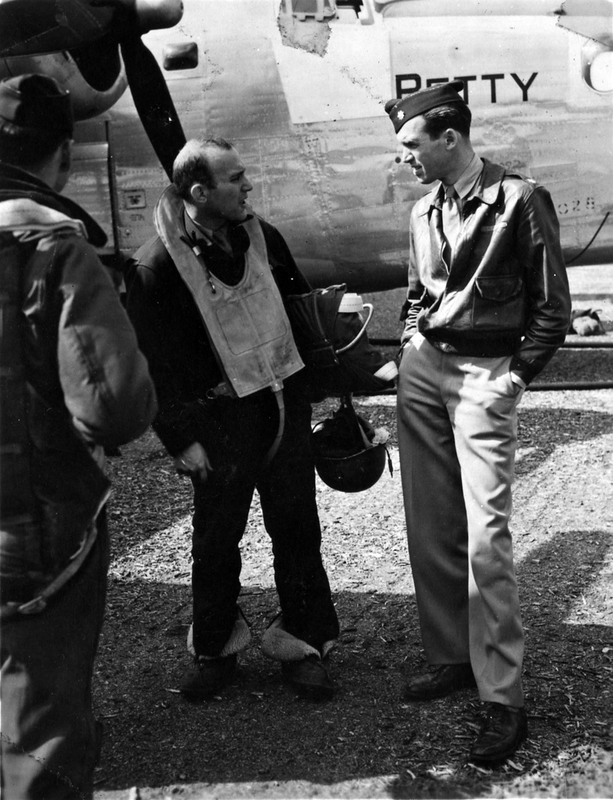 March 29, 1945: Movie star Jimmy Stewart promoted to full Colonel. Stewart is one of the few Americans to rise from a Private to a Colonel in four years. In 1946, Stewart appeared in It’s a Wonderful Life with Donna Reed. April 12, 1945: Harry Truman succeeds FDR as president, taking over just before the end of WWII. Truman made the momentous decision to drop the atomic bomb on Hiroshima and Nagasaki, ushering in the atomic age. May 23, 1945: The historic photo, Raising the Flag on Iwo Jima, ist aken at Mt. Suribachi in Japan by Joe Rosenthal became one of the most significant and recognizable images of WWII. June 20, 1945: Abbott and Costello’s film, “The Naughty Nineties” released the longest version of their “Who’s on First” routine. August 14, 1945: V-J Day. Japan surrenders unconditionally at the end of WWII. V-J Day in Times Square, the famous photo of the sailor kissing the white-clad nurse, was taken. October 3, 1945: Elvis Presley makes his first public appearance at the age of 10. October 8, 1945: Perry Spencer accidentally discovers that microwaves can heat food; he files for a patent for a microwave cooking oven. 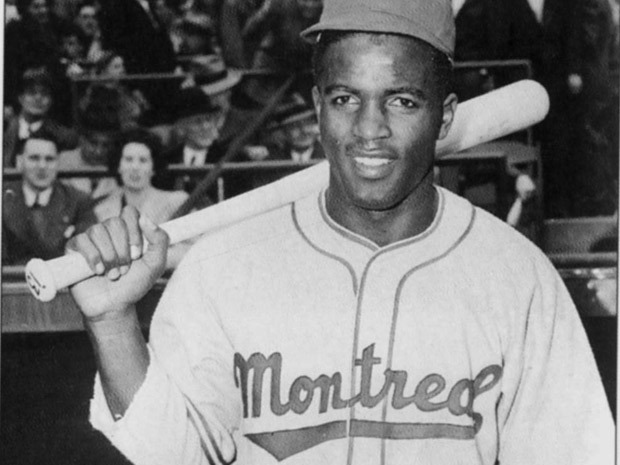 October 22, 1945: Jackie Robinson signs a contract with the Montreal Royals. Two years later, in 1947, he is the MLB Rookie of the Year, the first African American to play in the MLB.